Earth’s magnetic field is not about to flip. While the intensity of this field has weakened in the last couple hundred of years, researchers have found that this doesn’t mean it’s about to reverse. Humans have lived through dips in magnetic field intensity before. However, there are debates about whether reversals of the magnetic field in the distant past had any connection to species extinctions. Today, a magnetic field reversal would have a huge impact due to one very important thing: technology. The magnetic field deflects the solar wind and cosmic rays. This means that with a weaker field, more radiation gets through which can disrupt power grids and satellite communications. 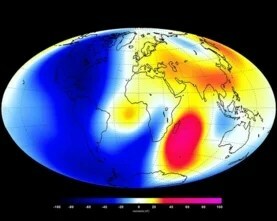 Changes measured by the Swarm satellite over the past 6 months shows that Earth’s magnetic field is changing. Shades of red show areas where it is strengthening, and shades of blue show areas that are weakening. Earth’s magnetic field, which protects the planet from huge blasts of deadly solar radiation, has been weakening over the past six months, according to data collected by a European Space Agency (ESA) satellite array called Swarm.The biggest weak spots in the magnetic field — which extends 370,000 miles (600,000 kilometers) above the planet’s surface — have sprung up over the Western Hemisphere, while the field has strengthened over areas like the southern Indian Ocean, according to the magnetometers onboard the Swarm satellites — three separate satellites floating in tandem. Tags: Dennis Kent, Earth, Global Positioning System, Magnetic Field, NASA, the journal Proceedings of the National Academy of Sciences. « Earthquake – Magnitude 6.2 – 66km NNW of Taltal, Chile. Total of 7 earthquakes in 7 days ranging in magnitude from 4.6 to 6.2.